Ben King...again. King fits the description that Shango gave of Dirty Hand walking with the fallen elder. 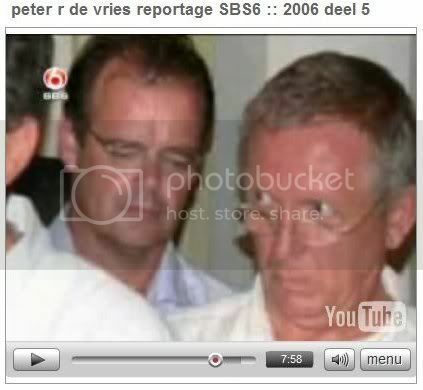 He is the only one besides Straten that was actually seen with Paulus. I don't think Shango was as cryptic as some think...anyone that has read my posts already knows this...Shango was talking to people that knew who he was and some that didn't, but he was either misdirecting or giving information which is debatable. I think if Shango says he walked with the elder he means he was there with Paulus. If Shango says he walks in all houses then he would be the person able to know everything that goes on in Aruba. Yes, I believe Shango was cryptic to some degree, but I think everyone, myself included, tends to over analyze the details. How can you tell a tale and no one understand what you mean and still get your point across to those reading? Why make it so hard to understand that you are never recognized for what you have accomplished. Shango had an ego...that is important. Hi Mum, yes! this is the correct picture. That is my screen shot from the DeVries Crime show. That is Ben Voc / King. Rob, hey thanks for the welcome! Let me toss this one out...could the references of Babylon actually refer to the modern country that it is today? Since Aruba is a trampoline island for drugs, could it also be for arms to VZ, CO or MX (gamblers are up in arms)? FBI was crawling all over Aruba, so were Dutch F-16 fighter jets on July 3 and their infra-red cameras. But as we saw FBI has no jurisdiction in Aruba, per se. Arawaks (Aruba natives) afraid of DirtyHand. Babylonians afraid of DirtyHand...and DirtyHand returned to Babylon, broken, but annonymous. Thanks Rob...that was the one thing that made it the right one for me when we were discussing this a couple of months back...that De Vries must have named the right guy! I believe vms made that point, and most agreed. Hi Silverfox....we would have to go back a while for info on that...Do you have any thoughts on his so called accident. IIRC another car was seen leaving the scene. I have seen Hendrick's name associated with this...I think he is worse than Rudy....seems to stay under the radar, around here at least! DirtyHand, IMHO, is someone ruthless, untouchable, and scares the heck out of everyone- someone who either writes Black Notes and/or is a practicing Muslim who's left hand is referred to as 'dirty hand'. There are many who think SHussain is still 'alive and well' because he had many imposters. http://stargods.org/SaddamsImposter.htm I for one don't know what to beleive anymore. Arawaks want to make cowboys happy. Babylonians want to maintain integrity of Great House. Gods of the cowboys know there was a game in the great house, and so DirtyHand was discovered. But the sacrifice will be offered before dirty hand sings. He will return to babylon, broken but anonymous. Hey - like I said earlier - just tossin' it out there for interesting discussion! Mum, I remember reading clear back in '05 -- I think in in RWV, that the BC accident was really an assassination... but who knows? But in this context if This is what Shango was telling us -- Dirty hand would be older, and perhaps under the radar, but someone who knew and worked with Beticoe, perhaps on the sovereignty issue -- high enough and respected enough to be instantly recognized as a respected public figure (maybe even retired) on the island -- but not necessarily of the the island. perhaps someone with good research skills could run an association investigation into the associates of Beticoe when he was the "elder" and alive and see if any of the names match up with what we now know? Hendrik Croes - a brother of the island's legendary leader, the late Betico Croes who guided Aruba to its semi-independent status in the Dutch realm - is one of the leading political figures on the island. He led several election campaigns for the MEP, now in the opposition. The Croes Family has been accused of ties with Cuntrera-Caruana. The Sicilian mafiosi payed for a trip of another brother, Rudy Croes (who succeeded Hendrik as Minister of Justice in a previous MEP government) as party secretary to a meeting of the Socialist International in Turkey. This has not been denied. DirtyHand walks with the Babylons, the Arawaks and is consort to the fallen elder. The gods are talking. 1. A husband or wife, especially the spouse of a monarch. 2. A companion or partner. 3. A ship accompanying another in travel. 4. Partnership; association: governed in consort with her advisers. 5. A group; a company: a consort of fellow diplomats. b. An ensemble using instruments of the same family. 1. To keep company; associate: a politician known to consort with gangsters. 2. To be in accord or agreement. 1. To unite in company; associate. Consort a number of people consorting together or in a company; a company or set of musicians; an assembly; a divan or consultation—Johnson, 1755. Examples: consort of authors, 1654; of bird calls, 1711; of birds, 1712; of fiddlers, 1656; of knavery, 1598; of musical instruments; of musicians, 1616; of parasites, 1702; of plaudits, 1667; of praise, 1705; of ships [sailing together], 1591; of viols, 1883; of virgins, 1604. 3. consort - keep company; "the heifers run with the bulls to produce offspring"
Fine! The fallen elder is not Paulus...Merian referred to him as the same...so I guess I am mistaken. To me, it is the only thing that fits at this point. In context he was referenced as a failed judge, so when Shango said elder, at that point in time, which would be in June...Paulus was the person everyone was talking about on the FP comments. Merian used the term also...so again...I am using the plain and simple version because Shango was speaking to posters from all over the world on the FP. Remember Shango is the one that mentions the elders and how they run things on the island. Simian began to use Shango's terms such as the difference between Sumerians and Arawaks. Obviously I am mistaken here but that is my opinion and I'm sticking to it for the time being. All along the guards cried. The checkmate was a joke. The boy is a foul mouthed fool. palace have been taken from him, yet he still remembers the passage ways. In 1968 he arrived in Canada with 100 dollar in his pocket pretending to be an electrician. Ten years later he was stopped at the international airport of Zürich in Switzerland with 600,000 dollar in a suitcase. He was released after paying a fee. At the beginning of the 1980s Alfonso established himself near Lugano in a luxurious villa, supervising the laundering of dollar-deposits at Canadian banks channelled through Swiss accounts. Two years later he moved to the stockbrokers belt near London. From his £450,000 mansion, driving around in his BMW 732i or Mercedes 500 SEL, he supervised a heroin pipeline from Thailand, through England, to Canada. He went to Thailand to set up the route. When the pipeline was dismantled in England, he managed to escape arrest, moving to a Montreal suburb where he opened a pizzeria. Alfonso prepared the pizzas while his wife tended the pay-desk. At the time Alfonso Caruana was already high on the most-wanted list because, according a high-placed Italian police official, "he was the one who knew most about Mafia finances." (87) When the Canadian tax-man moved in (alerted by the police who were unable to indict him) he left for Caracas, ignoring the 827,962 Canadian dollars the tax collector had seized. Law enforcement lost his traces. He is still at large, despite his conviction to 20 years' imprisonment by the Palermo Court. I too believe Betico was assassinated. I wrote about it on my blog, so I'm aware of what took place. The info I gathered is the usual run of the mill stuff that most have also read. That's what is available in English. So, let's just speculate that Betico was indeed assassinated. Who would be motivated? That's the first question. Who benefits when Betico is gone? Oduber does. We know that, but that's the public end. Who benefits on the underworld end? Removing Betico from the public scene could help the Cuntera's or other mob related interests. Do we know whether there was anything that put Betico and the Mob at odds? I'm not sure I have seen anything, and one other thing makes me wonder...-> why would the mob kill Betico when he removes Holland from the picture in a lot of areas? He makes it easier to move drugs and launder money. So, if that's true, maybe it's not the mob that kills Betico, but someone in the opposition that wanted him dead for REMOVING HOLLAND. Maybe the Babylonians killed Betico? According to Caps, Dirty Hand is the guy whose name I will never spell correctly...Deutkom or whatever. I don't know enough about him to explain his reasoning...in fact...I doubt the FP posters had ever heard of him when Shango was posting...so once again...context is everything...but only in my book. Rob - there was a rumor that a certain family was involved in the accident. Mum and LaLa's - who knows, maybe Julia Renfro could even be Dirty Hand. Just like JM, her newspaper goes to all houses. Who has been a consort to the fallen elder? Check the party-goers. Oh, and Regnad is here. That darn Regnad! He really should move on. And lest I stir another controversy? There are other newspapers that go in all houses and are read by the locals. Didn't call any names, but Regnad beware! · Desiree Coronel Desiree Coronel · Dana Ber Dana Ber · Armin E.
Saladin are the vocalists in the Mi Dushi Band!! !